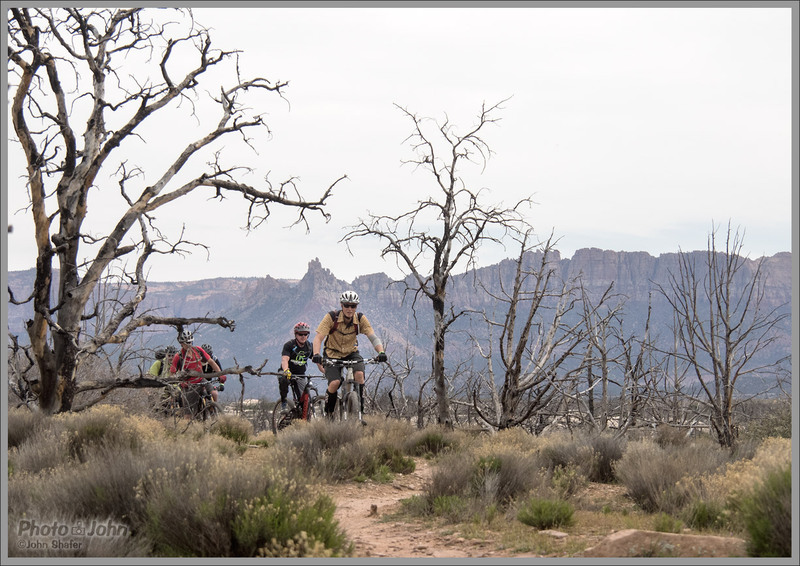 I just came back from a great weekend of mountain biking and photography in Southern Utah, near Virgin, Hurricane and Zion National Park. 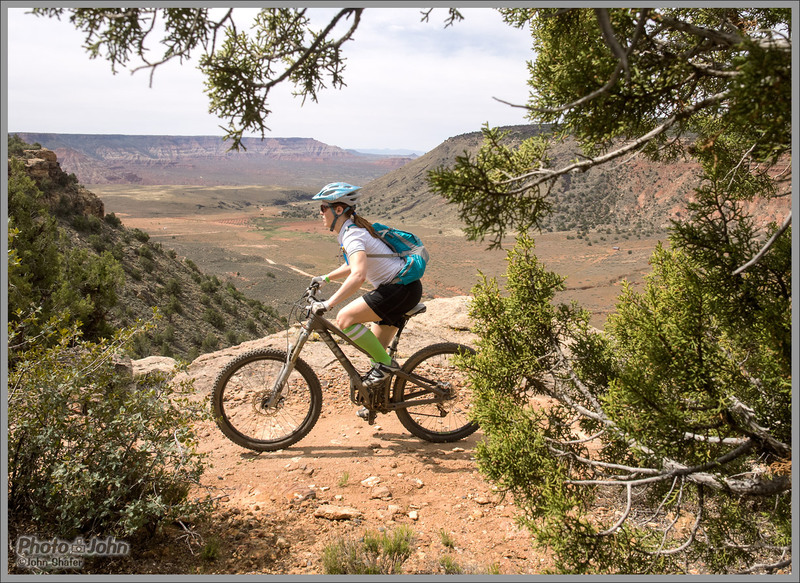 I’ve done a lot of road trips in my life and shot a lot of Southern Utah mountain bike photos on some of these same trails. But this trip was more significant than most as it was my first mountain bike outing since I tore my Achilles, last June. This was also my unofficial debut as a full-time freelance photographer. Yeah – you read that right. Photo-John is 100% solo now. So if you need some sweet product photos, an outdoor action shoot, or anything else I can help you with, please let me know. I need the work! Slickrock section near the beginning of the Guacamole Trail, with the cliffs of Zion National Park in the background. 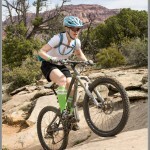 It felt so good to get out and pedal on the dirt and slickrock. I’ve been riding on the pavement for a few months now but I only did my first real mountain bike ride, last weekend. And that wasn’t much of a ride – more of a test to see if everything still worked. The plan for this trip was to take it easy and maybe just do one mellow shuttle ride. That isn’t how it turned out, though. 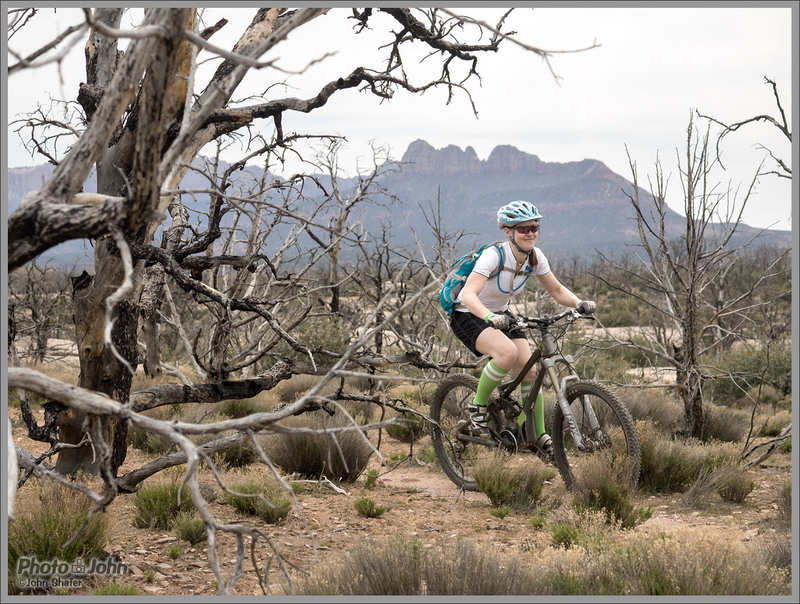 On Saturday, I drove Jenni up to Guacamole Trail, just outside of Zion National Park, but the group she was going to ride with had already left. So I decided to give it a try, even though Guacamole was a little more than I had planned on tackling. 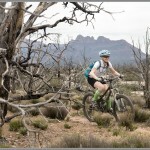 I rode flat pedals and got off the bike for a few technical bits that I usually would have ridden. But overall it went very well. 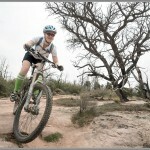 I got to ride a good chunk of a really fun trail with my favorite ride partner (my wife, Jenni, a.k.a. 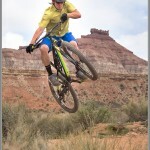 “Photo-Jennic”), and I got to shoot a bunch of mountain bike photos in a really stunning location. 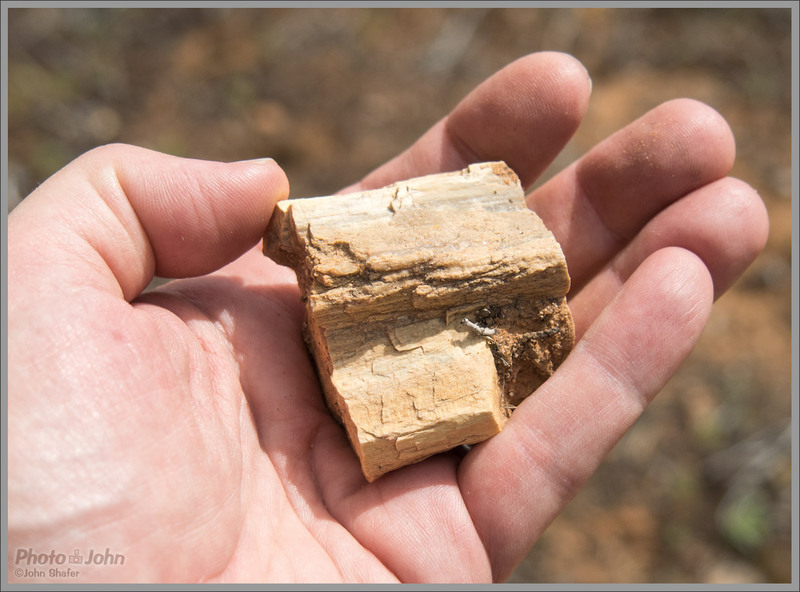 Even better – my ankle felt fine on Sunday morning! 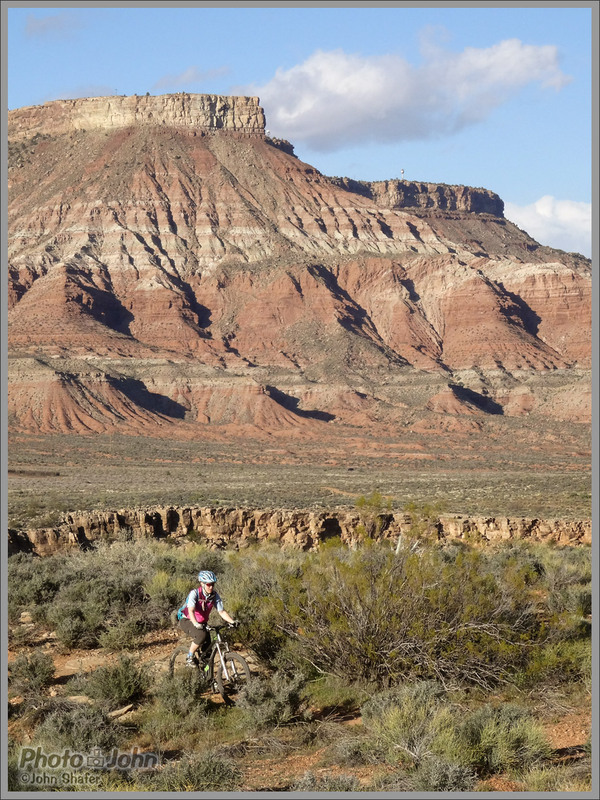 A group of riders on Guacamole Trail, in Southern Utah, just outside Zion National Park. 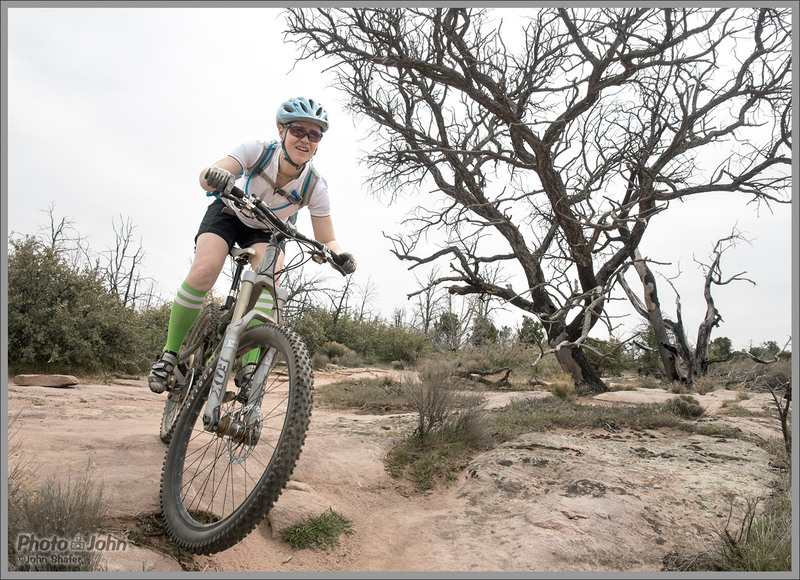 Sunday was windy and rainy but it cleared up in the afternoon, just in time for us to do a shuttle of the Jem and Hurricane Rim trails. I’ve ridden Jem and I didn’t think it was going to be a big ride. Turns out that adding Hurricane Rim makes it pretty substantial, though. 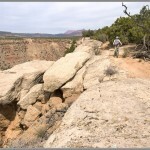 The Rim Trail is pretty rocky and has some significant climbs as well as a bit of exposure. I ended up walking some of the steeper and more technical sections, just to be safe. And I was pretty beat by the time we reached the top, overlooking the Hurricane Valley. I’d love to include a photo of that but I pulled a serious rookie move and went out with two cameras with uncharged batteries. That’s a pretty solid way to make my freelance photographer debut – riding with two cameras that don’t work. Pro tip: recharge your camera batteries every night – no matter what. 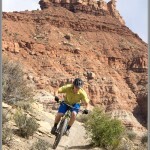 Tearing up a steep bit of singletrack below Gooseberry Mesa, on Jem Trail, in Southern Utah. 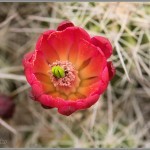 I’m thinking every article on this site with photos should include some gear info for the camera nerds in my audience. All of the photos in this story, with the exception of two that I took with a point-and-shoot after the battery died, were taken with the Olympus OM-D E-M1, Olympus’s top-of-the-line interchangeable lens camera (read my Olympus OM-D E-M1 intro article). Right now, it’s my favorite all-purpose camera. I really like it for travel and outdoor photos. 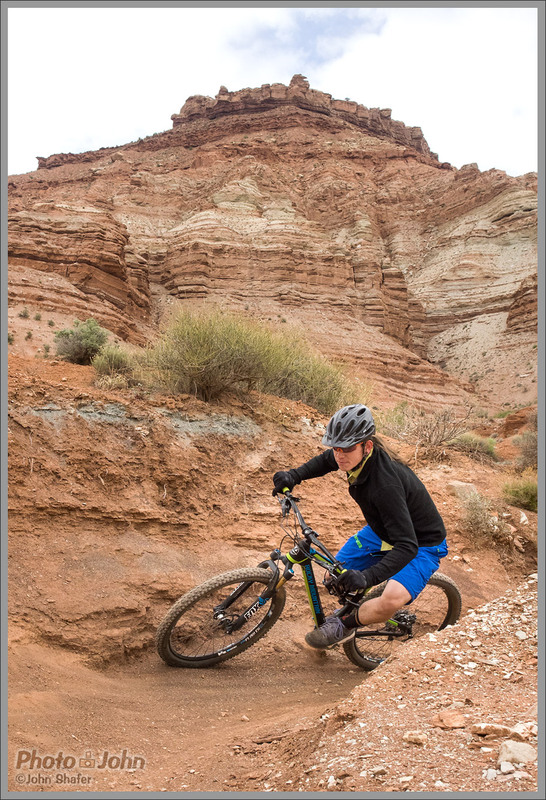 It packs a ton of performance into a very compact camera that’s easy to carry on the mountain bike, skis, etc. 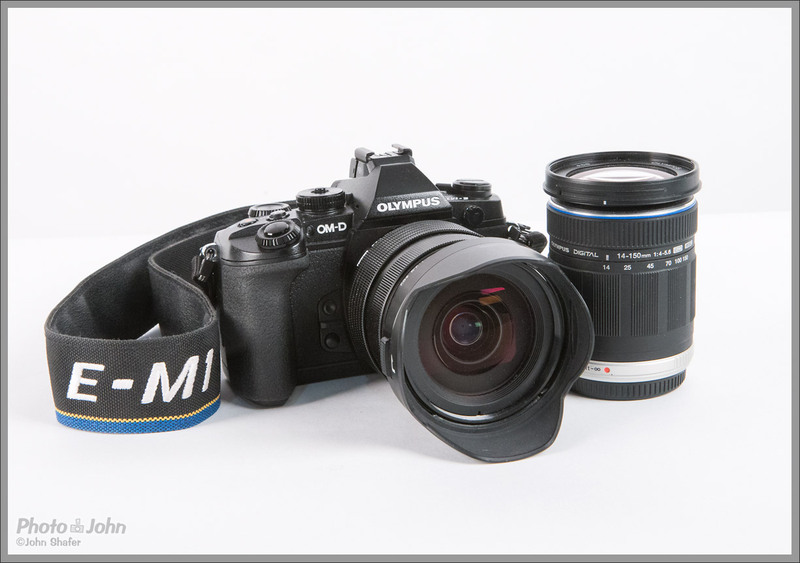 For the two rides in this article, I carried it with the Olympus 12-40mm f/2.8 and 14-150mm f/4-5.6 zoom lenses, for a total equivalent zoom range of 24-300mm. That’s a lot of reach in a very small package. 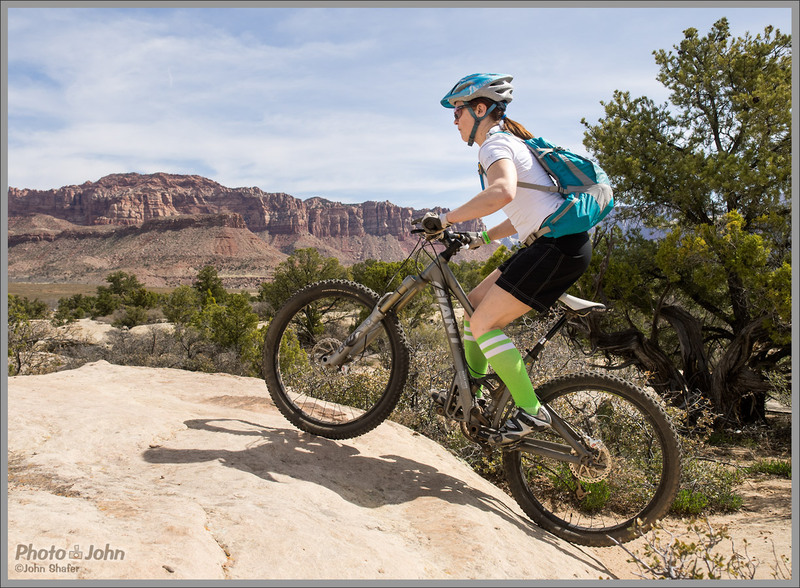 Because of its tiny size and excellent performance, the Olympus OM-D E-M1 is a great camera for mountain biking and travel. 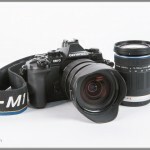 This is my current mtb ride kit – the E-M1 with 12-40mm f/2.8 and 14-150mm f/4-5.6 zoom lenses. I’ve found the image quality of the E-M1 is very good for action photos in good light, too. The only compromise is the auto focus. The single shot AF works great but the continuous AF performance is a little iffy. I’ve been able to get good results with it but not consistently enough to gamble with it in a situation like this, where I can’t easily re-shoot. 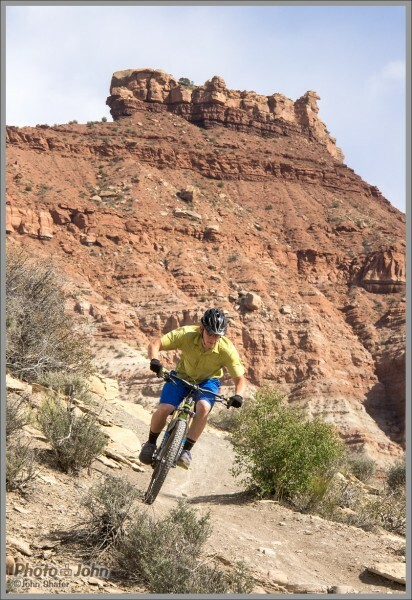 However, for trail shots like you see here, it’s no problem to plan the shot, pre-focus and shoot a burst. In fact, that’s an absolutely fool-proof technique. I’d probably use the same technique with any other camera on these trails. 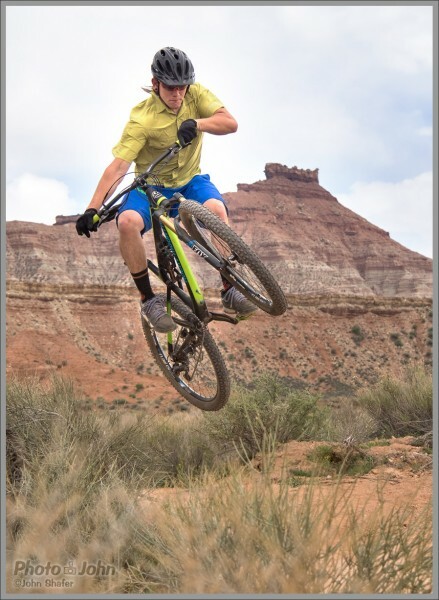 Jordan Rarick, throwing a little style on a Jem Trail floater, with Gooseberry Mesa in the background. Oh yeah – the battery dies quickly, too. When I left for the ride it, the camera was still indicating a full battery charge. But after shooting one burst of about 6 frames, at the beginning of the ride, it went dead. I was able to squeeze a few more frames out of the battery before it went completely. But I really wish it would give more warning before it dies. It’s still my fault, though. I should have charged it the night before. 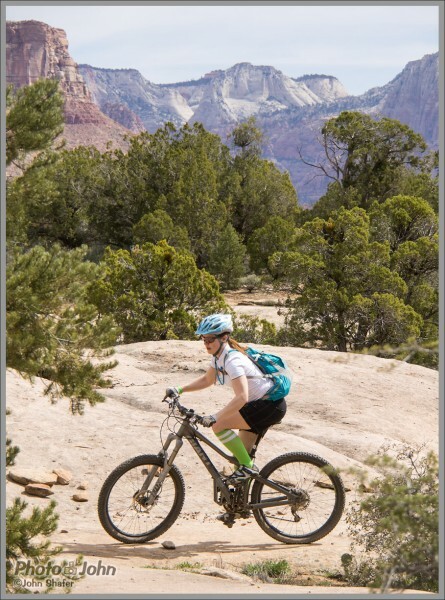 Jenni, riding the exposed rim section of the Guacamole Trail, near Zion National Park. 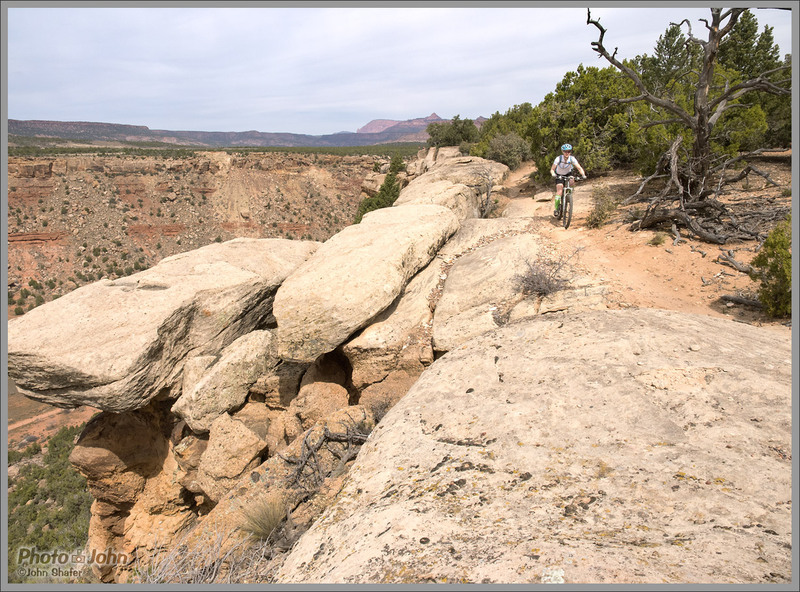 Diving into a corner in a burned section of Guacamole Trail – near Virgin, Utah. 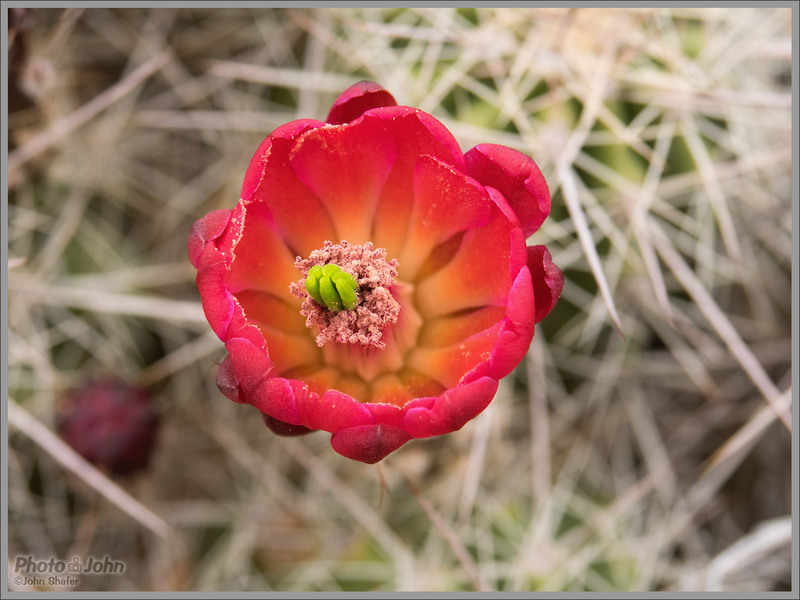 A sure sign of spring – blossoms on the cacti. Jenni, on a steep bit of slickrock on the Guacamole Trail, with the cliffs of Zion in the background. 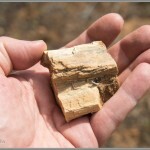 A piece of petrified wood from Guacamole Trail, which is absolutely littered with the stuff. 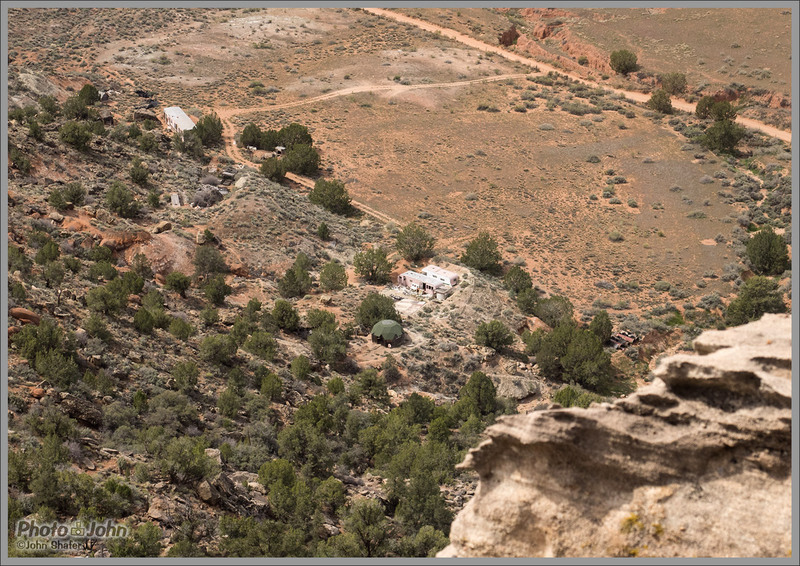 An abandoned hippie camp, below the rim of the Guacamole Trail, near Zion National Park. 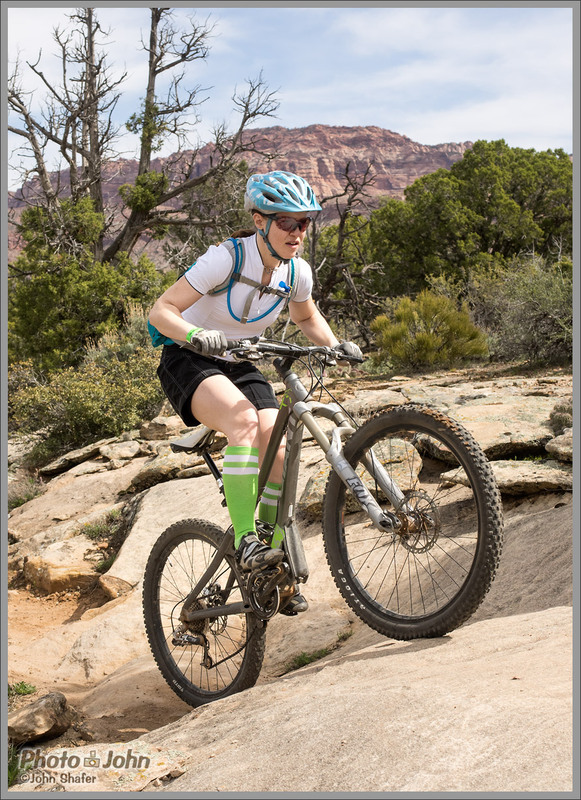 Jenni uses the power of her green socks on a steep bit of slickrock, with Zion National Park in the background. 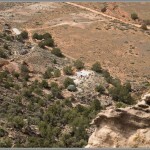 Burned-out section of Guacamole Trail, on the border of Zion National Park, in Southern Utah. 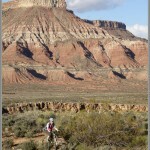 Jenni, on the rim of the Guacamole Trail, looking south towards Gooseberry Mesa. 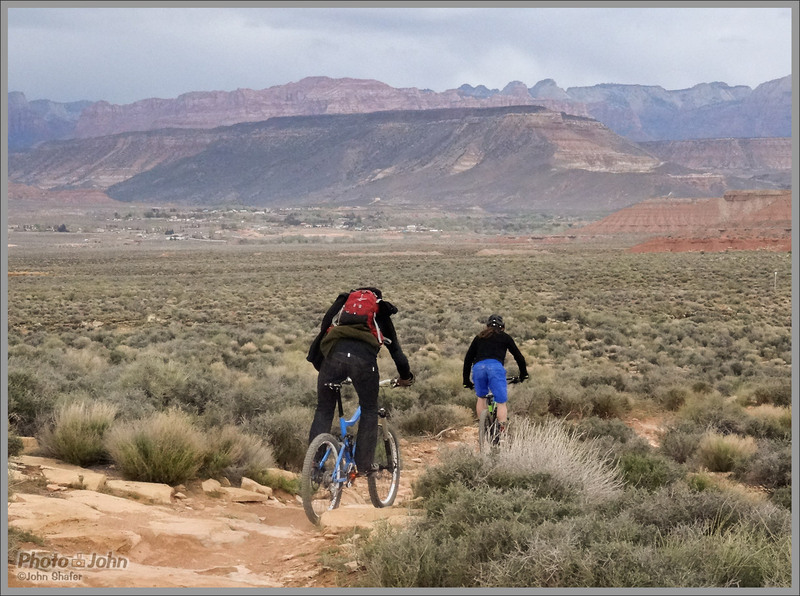 Troy and Jordan Rarick, dropping down a cobbly section of Jem Trail, with Virgin Utah and the cliffs of Zion in the distance. 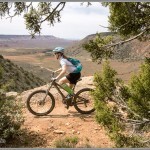 Jenni, on the Hurricane Rim Trail, on the Virgin River Gorge. Berm shot near the top of Jem Trail, below Gooseberry Mesa. Rider: Jordan Rarick. Photo-Jennic – I like that!